A crossroads for human migration and trade between Europe and Asia since time immemorial, modern ways of life in China’s northwestern Xinjiang Uyghur Autonomous Region are facing challenges brought about by global warming. Higher temperatures in the high, arid and mountainous region are causing glaciers to melt, while population growth and increasingly intensive agriculture– cotton farming in particular– are draining aquifers at faster rates. Surrounded by ancient, legendary mountain ranges, the Tarim Basin is the largest arid inland basin in China. Glacial meltwater accounts for 40 percent of the region’s water supply. Glacial meltwater runoff has been increasing as a result of rising temperatures, but that also means the glaciers are shrinking, which, in turn, means they’ll be storing and providing less water in future. That’s going to leave growing communities and downstream farmers “high and dry,” according to a report from Yale Environment 360. More than half the 800-mile Tarim River has run dry in four of the last 10 summers, Hanoi-based writer Mike Ives reports for Yale Environment 360. The region’s cotton farmers, who irrigate their crops six or seven times per growing cycle, are among the hardest hit. The response to date has been to drill more and deeper water wells and to implement a water rationing system. The former, as it further depletes groundwater reserves, only exacerbates the problem, however, and the latter is proving very difficult to manage effectively. The Chinese Army indirectly or directly controls the region’s cotton farms, and they tend to put their own narrow commercial interests above all others. Researchers participating in a joint, five-year, $9.3 million Chinese-German research project are looking for more sustainable, more equitable long-term solutions. Researchers from 12 German universities are working with Chinese counterparts to enhance regional water security in what’s been dubbed the Sustainable Management of River Oases Along the Tarim River project (SuMaRiO). Funded by the German Federal Ministry of Education and Research, the SuMaRiO team will “work with farmers, communities, and officials in the basin to plan for a day when groundwater reserves are further depleted and runoff from glaciers may be considerably reduced,” according to Ives’ report for Yale Environment 360. The severe challenges posed by melting glaciers and shrinking water resources extends across borders in the region, as well as to other regions similarly affected, Ives notes. Four former Soviet Central Asian republics border northwest China also rely on the region’s glaciers for much of their water. Communities that relay on glacier meltwater for a signficant portion of their water in Peru’s Cordillera Blanca are facing the same problems. Rain and snowmelt in many mountain ranges around the world, not glacial meltwater, feed river systems. Not so in the Himalyas and Cordillera Blanca, however, Ives notes. About half of Himalayan glaciers lie at elevations above 5,500 meters (17,875 feet), which means they won’t be melting anytime soon. In contrast, populations in the Tarim River basin and those in the Peruvian and Bolivian Andes depend significantly on glacial meltwater runoff. Runoff from some 14,000 glaciers supply water in the Tarim River basin. 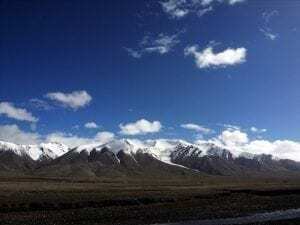 The region, which spans an area roughly the size of Vermont, is surrounded by mountains shrouded in history and legend, including the Tian Shan, the Kunlun, the Karakorum and the eastern Pamir. Communities in China, Kyrgyzstan, Pakistan and Tajikistan rely on meltwaters to water and feed growing populations. Glaciers feeding water throughout the Tarim River basin have shrunk about 8% in volume and 7% in surface area during the past forty years, according to Ives’ report. That’s slower than what’s been taking place in many parts of the Andes and Alps. That’s caused glacial runoff to increase—13% since the 1990s due to rising temperatures. River flows are shrinking in the Tarim River basin nonetheless, however, due to an even sharper increase in irrigation. The growth of water-intensive cotton farming is responsible for much of the increasing demand for water for irrigation. Increasing glacial melting also means they’ll be less water stored in glacial ice in years to come. Tarim River basin cotton farms account for more than 1/3 of China’s total cotton production. Increasingly intensive cotton farming is also causing other problems that will come to haunt the region’s farmers and communities if left unchecked. Soil quality, and hence yields, are declining due to salinization, and surrounding areas are increasingly suffering from desertification. Being arid, the region is actually a poor choice for cotton farming. The Tarim River Basin receives an average of only 3 inches per year of rainfall. Substituting other native crops for cotton is one avenue being explored by the SuMaRiO project team, Ives explains.